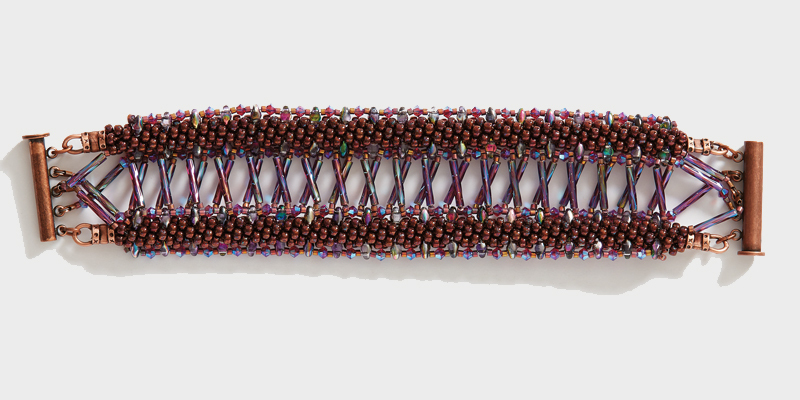 Bead artist Maggie Thompson incorporated two of her favorite things within her Crossing the Bridge Bracelet to create an eye-catching design—bugle beads and kumihimo. While this was a difficult mix, she pulled it off! 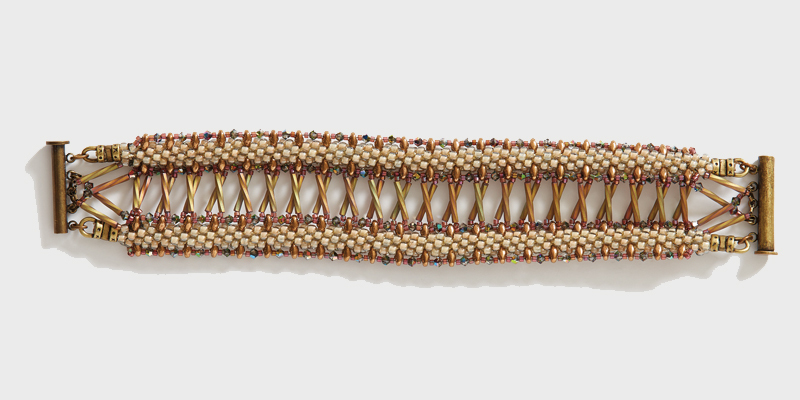 Keep reading to discover Maggie’s inspiration for and trials with this stunning bracelet. Find the pattern today in Beadwork August/September 2018. As an artist and designer, I’m always looking for unique ways to use beads in my kumihimo designs. 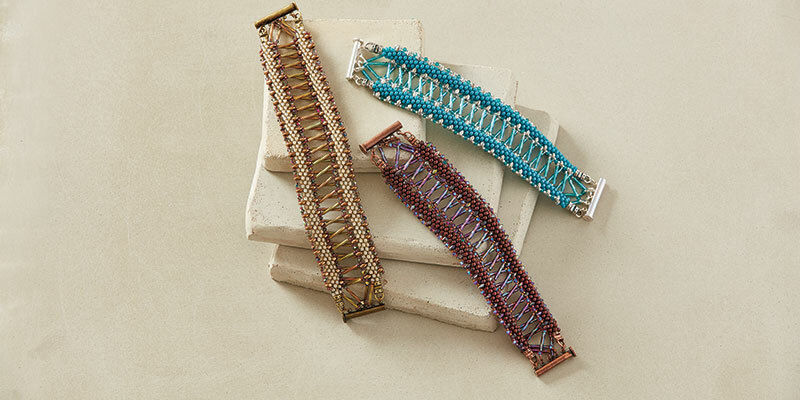 Before I discovered kumihimo about 4 years ago, my designs were centered around bead weaving, and one of my favorite beads to use was the 12mm twisted bugle bead. It’s an elegant bead that lends a lot of sophistication to any creation. Therefore, my dilemma was how to come up with a way to use this bead in a kumihimo design. Sometimes my designs appear in my head as full-fledged ideas, with the details all worked out. Others, not so much! In this particular instance, the inspiration came to me in stages as I created the design. First, I needed to look at the actual properties of the bugle bead and how best to highlight it. Obviously, its length pretty much prohibited using it within the actual braid. After some thought, I decided to connect two kumihimo braids with the bugles. However, just connecting the braids with the bugles in a straight ladder-type stitch wasn’t appealing to me. After mulling over various ideas, it seemed to me a latticework look was the way to go. The final piece of the puzzle was the clasp. I had experimented with the Regaliz glue-in magnetic clasp where a portion of the braid at each end is glued into a channel, but this clasp is expensive, making the overall project price pretty high. Also, this type of clasp can be hard to open since the magnet is very strong. I finally decided on a 5-loop clasp because it would allow me to embellish my connection in a way that enhanced the whole bracelet design. Therefore, the cross-piece idea came to me, echoing the lattice look of the bugles between the braids. This project was definitely a labor of love for me since I used my beloved bugle beads in a new and exciting way with my favorite technique—kumihimo! 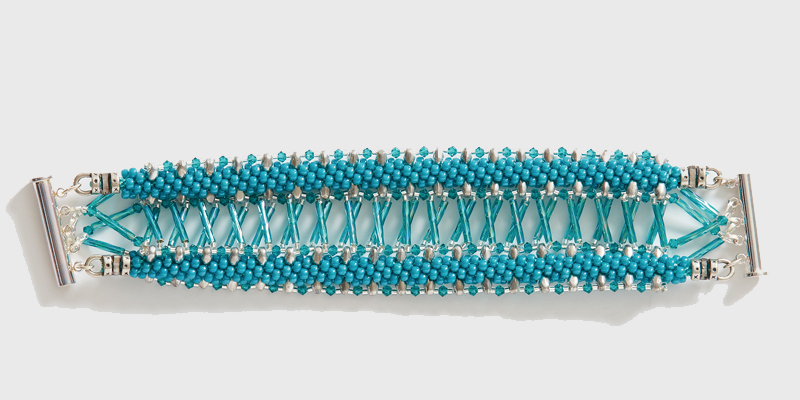 Stitch a crisscrossed bridge of bugles between two kumihimo ropes to create this bold bracelet. Check each hole of the two-hole beads to make sure both are open. Throw away any beads that have a closed hole, or use a bead reamer to open the hole. Do a test braid with the size 8° seed beads to ensure that you get six beads per braided inch. Make note of any necessary changes and adjust your pattern accordingly. 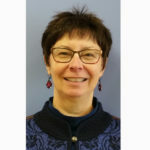 MAGGIE THOMPSON has been making things all her life, from sewing to quilting, knitting to crochet. 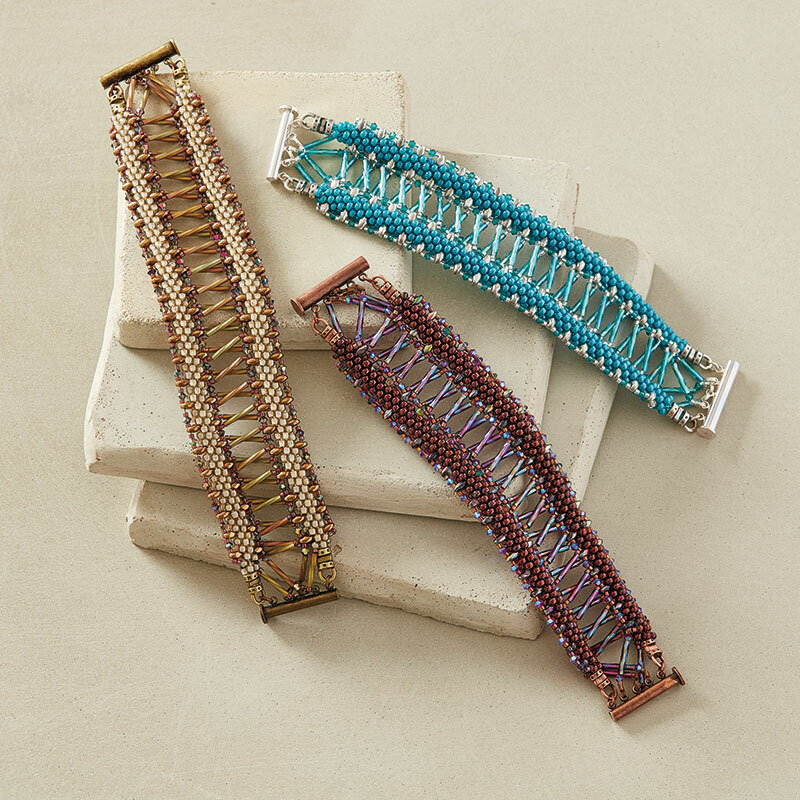 She discovered beading in the early 1990s and fell in love. Maggie’s designs have been featured in classes and in kits. Her work appears in several galleries, and she has won numerous awards for her kumihimo designs. Maggie’s patterns and kits are available on her website, www.maggietdesigns.etsy.com. Contact her at maggie.t.designs@gmail.com.